Three of the Kirton brothers in uniform at the family home in Easthorpe during WW1. Left - Frank Kirton, South Notts Hussars; centre - Isaac Kirton, Leicestershire Regiment (later joined the Labour Corps); right - Tom Kirton, Kings Own Yorkshire Light Infantry. 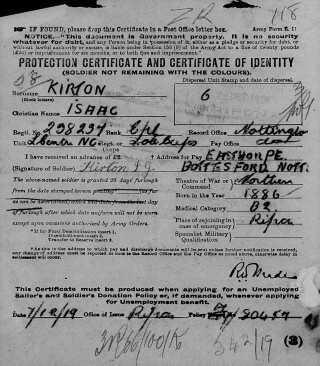 Isaac George Kirton was recorded on the list of Bottesford Absentee Voters in 1918/19 as Private 238237, 410th Agricultural Coy, Labour Corps, his home address Easthorpe. 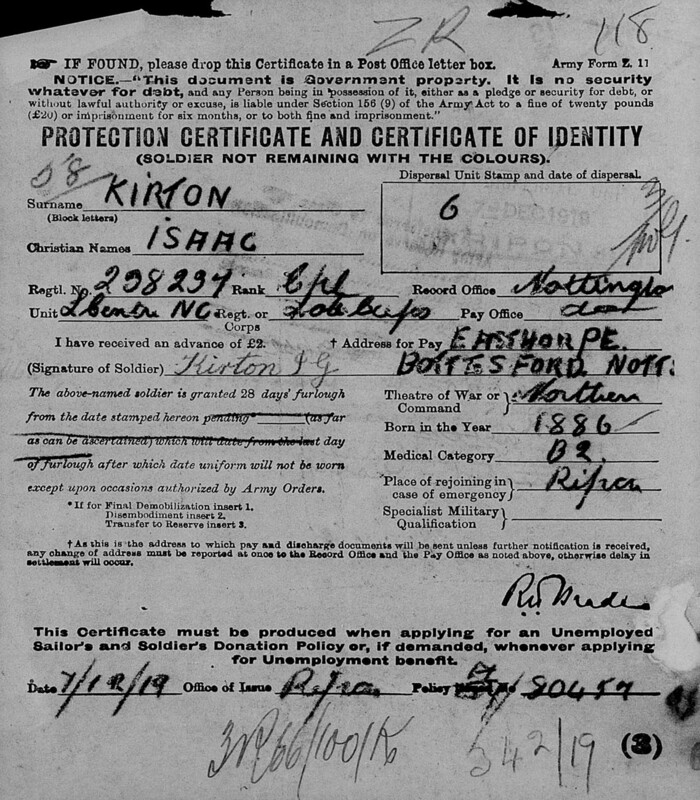 Isaac George Kirton was born in Easthorpe, Bottesford in 1886, son of John and Ann Kirton. 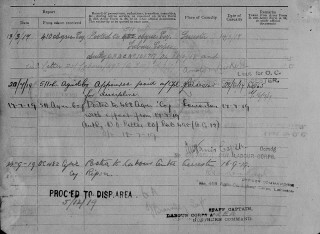 John was born at Easthorpe in 1855 and Ann (nee Johnson) at Gelston, Lincolnshire, in 1862. 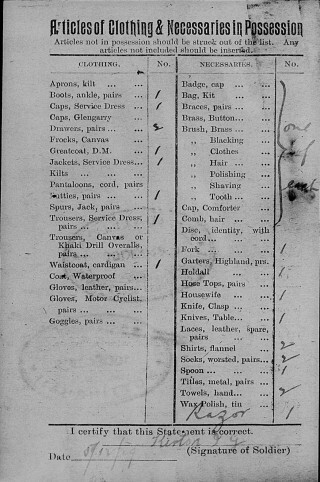 John and Ann Kirton had a large family. Ten children are known from the Censuses: Eleanor (b.1883), John William (b.1884), Isaac George (b.1886-1968), Lucy Ann (b.1888), Robert Johnson (b.1891-1969), Sarah (b.1893), Frank (b.1894-1963), Tom (b.1896-1991), Edward Henry (b.1902) and Catherine (b.1903). In 1891, when Isaac was five years old, the family were living on Belvoir Road, Easthorpe, and his father was employed as a railway carpenter. By the time of the 1901 Census, Isaac was himself working, as a general servant on the farm of George Doubleday at Sutton Lodge, Granby. Isaac married Elizabeth Cooper at Borthwick Church on 18 April, 1910, registered at Grantham. In the Census of 1911, the couple had a little girl under a month old. Isaac, who now used his second Christian name George on the census form, was working as a farm labourer at Carrington Farm, Calverton. They had five children between 1911 and 1919. These were Mary Annie (born early in 1911), Ellen Elizabeth (birth date uncertain), George William (born on the 20th January, 1916, in Easthorpe), and twins John Frank and Florence Mary (born on the 31st May, 1919). 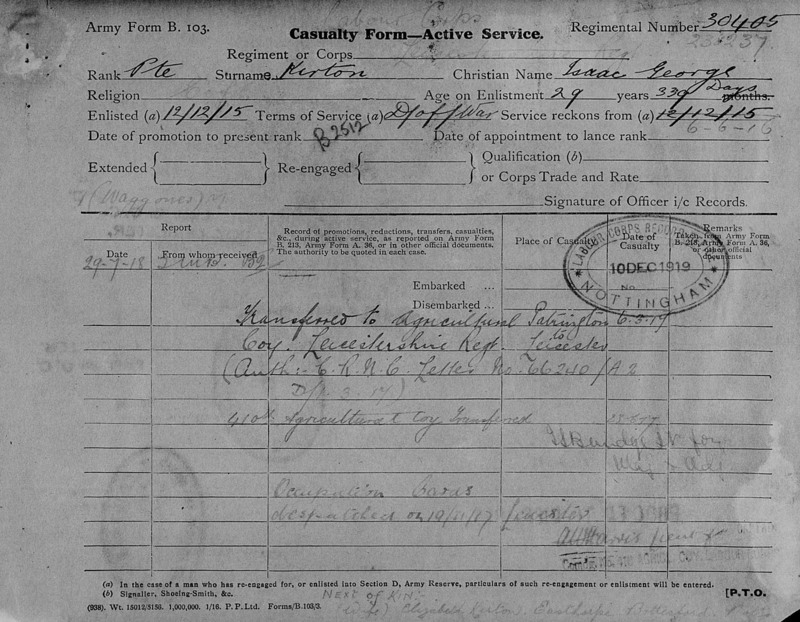 Isaac George Kirton attested on the 12th December, 1915, at Leicester, as 238237, Leicestershire Regiment. He gave his age as 29 and his trade as a carter. His Medical was on 6 June, 1916, and he was mobilized on the same day, joining his unit at Ripon to serve in the Northern Theatre of war (France and Flanders). He was transferred to the Labour Corps, Agricultural Coy at Patrington, East Yorkshire, and was part of the 410th Agricultural Coy on 23 June 1917. After the end of hostilities, he was with 511 Agric Coy. He volunteered to continue serving with the Army of Occupation for three months from August to November, 1919, and transferred to 482 Agric. Coy. After this extended spell with the Labour Corps, he was finally instructed to ‘Proceed from Line to Dispersal’ on the 10th December, 1919. 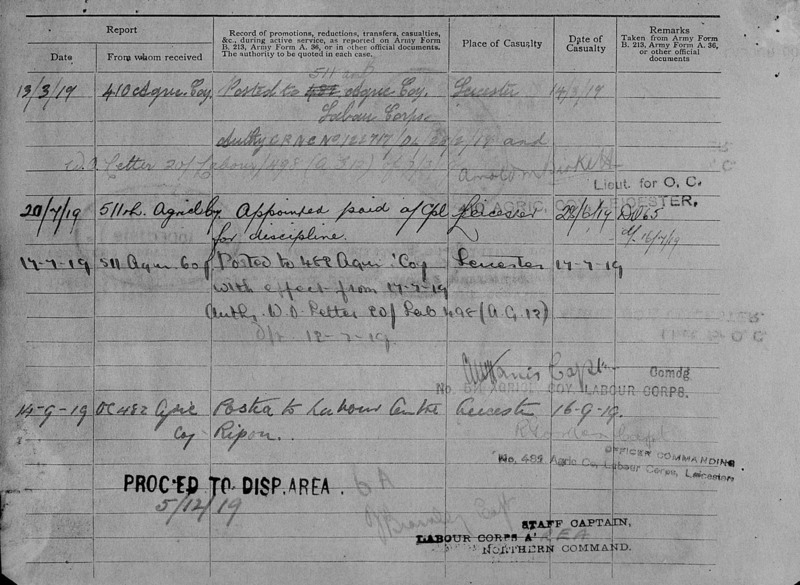 He was demobilized on the 4th January, 1920, at Nottingham. He had enlisted as a Private, and was promoted to a/Corporal and Corporal in 1919, towards the end of his military service. 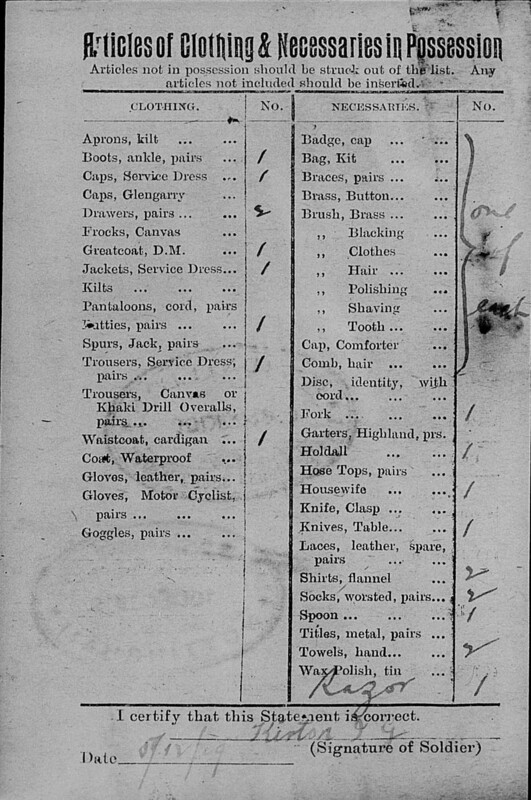 Among the service papers that have survived is a standard form listing his ‘Articles of Clothing and Necessities’ down the number of pairs of socks and his ownership of a ‘housewife’, which apparently was the name used for a sewing repair kit. 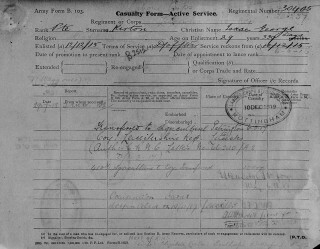 The must have been standard issue forms, one for each soldier, but they appear to be rare among the records that have been kept. This is the first example the present writer has seen. Electoral Rolls give evidence of where the Kirtons lived during the 1920s. In the autumn of 1921 they were at Kirkby Village, Kirkby Mallory (Bosworth parliamentary constituency); by the autumn of 1922 they had moved to the Gamekeeper’s Lodge, Burton-on-the-Wolds (Loughborough constituency); and then during 1924 they moved to Brewery Cottage, Beeby (Melton Mowbray constituency). Isaac died in December, 1968, at Leicester, aged 82.